The DIA Group has established a risk management model (hereinafter, “RMM”) with a systematic, detailed focus that allows it to identify, evaluate, and respond to risks related to the achievement of its business objectives. This model, which is based on the COSO II Integrated Corporate Risk Management Framework COSO II (Committee of Sponsoring Organizations of the Treadway Commission), ensures the identification of different types of risks (both financial and non-financial, such as operational, technological, social, environmental, and reputational risks). The DIA Group’s RMM has a risk management policy which is applicable to the company and all of its subsidiaries, approved by the Group’s board of directors. In the RMM application, DIA has contemplated all of its activities carried out in the different levels of the organisation, from the corporate level to those in the units and business processes, and are therefore applicable to the following levels: (i) execution of DIA’s strategy; (ii) achievement of the business objectives; and (iii) the proper execution of operations. The DIA Group’s Board of Directors, the Audit and Compliance Commission, and the Management Committee are responsible for ensuring the proper running of the RMM. Approval and setting of the risk control and management policy. Evaluation of the working quality and efficiency of the Board of Directors and the Commissions, approaching the risk management and supervision function as a key section. Specific monitoring of the DIA Group’s financial risks. Supervision of the internal control systems of financial information. Supervision and periodic review of the efficiency of DIA’s internal control and internal audit procedures. Internal implementation of the RMM and creation of the strategy, culture, people, and technology that make up the RMM. Analysis of the environment and new projects that can have a direct or indirect impact on DIA’s risks. Consideration of the inclusion of new risks and/or the disappearance of some of the existing risks. Recommendation of the development of specific action plans, monitoring planning, and continuity of existing plans. 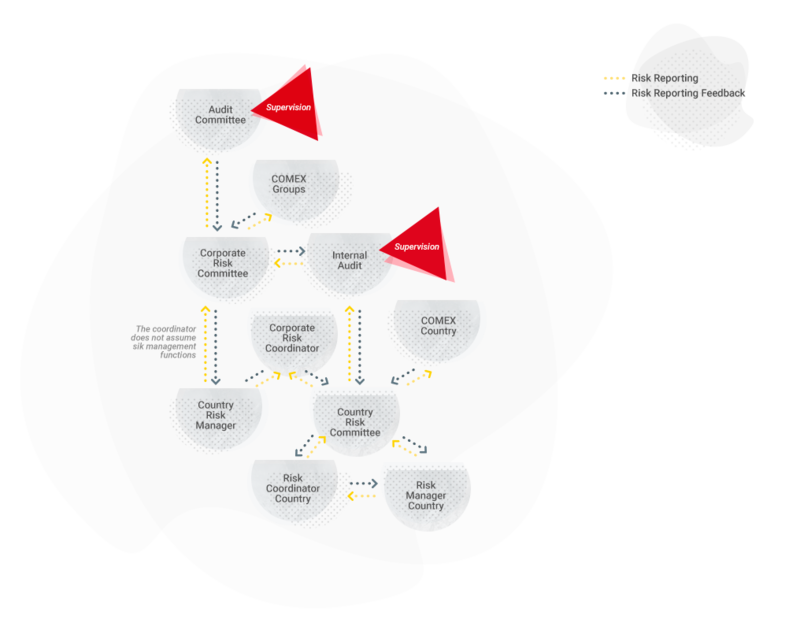 Continuous monitoring of key risks identified on the risk map, and in particular those that are closely related to DIA’s main interest groups, such as clients, franchisees, and suppliers. Evaluation and detailed analysis of DIA’s risks. Review of the functioning of the risk control and management system, and the effectiveness of the control activities implemented. Continuous risk monitoring, through previously defined indicators. DIA’s Executive Committee reviews DIA’s level of risk tolerance, which is presented to the Board of Directors to be reviewed and approved each year. The risk valuation scales (probability and impact) are updated at least once a year, so that they can be adapted to the business strategy and circumstances. These valuation scales contemplate the different dimensions of the risk impact and likelihood of happening (financial, sales, operations, regulatory framework, human resources, and reputation) and allow the company to value the risks in each country and at the corporate level. These scales form the basis for the definition of the Group’s level of tolerance. The DIA Group’s Risk Management Model defines tolerance as “the acceptable level of variation that DIA is prepared to accept in the achievement of its objectives”. This is therefore the maximum specific risk that the Organisation is prepared to take. The DIA Group’s main activity is the distribution of food, household, beauty and health products. In this context, the Group defines risk as any contingency, internal or external, which, if they materialise, would prevent or hamper the achievement of the objectives set by the organisation. Accordingly, it considers that a risk arises as a result of the loss of opportunities and/or strengths, as well as the materialisation and/or the strengthening of a weakness. Risks and/or questions related to the environment in which the Group operates, including, among others, Political, Economic, Social, Technological, and Legal aspects. Development of research and periodic market/country surveys. Implementation of obligatory internal regulation related to commercial issues. Regulatory control and monitoring procedure (regulatory map). Implementation of Regulatory Compliance Systems. Constitution of the Regulatory Compliance Unit. Implementation of best practices in terms of fiscal and tax issues. Risks and/or issues related with the corporate structure, the governance model, unethical irresponsible employee behaviour, or corporate social responsibility. Integration of social and environmental values in all management areas. Implementation of the Code of Ethics and Ethics Channel for queries and information. Corporate crime prevention and anticorruption policy. Corporate Policy in Marketing and Communication with Customers. Risks and/or issues related to the Group’s business model and the execution of key activities in its value chain, including, among other areas, product quality and safety, the supply chain, environmental, health and security issues, human resources, and social or IT issues. - Quality and price. Offer consumers solutions to their needs related to food and consumer goods with a unique commitment in the market to quality and price. - Care of the environment. DIA innovates in its daily work to cut its energy consumption, reduce the environmental footprint of its logistics activities, and properly manage its emissions, consumption, and waste. - Commitment to the people and groups with which it works. The generation of jobs, franchise development, agreements with suppliers, collaboration with humanitarian aid programmes, and value creation for shareholders and the company. Implementation of internal regulation that must be complied with in terms of systems and Information security. The Group’s activities are exposed to market, credit, and liquidity risks. For more details, see section 24 of the Management Report. The Group has a risk monitoring and updating system which allows it to identify and include in the company’s risk map any new risk that is identified, ensuring that all risks are reviewed at least once a year.